Universities are not dead. They have just gone from selling knowledge, information and methods to selling degrees. The question is how do universities reinvent themselves in an era of information overload, where every university course has its online replica (often better ones) and where students are exposed to orators a lot more talented than some of their professors. In an era where information was scarce, where most countries had rigid newspapers and perhaps two or three television channels, the only place where you could give your two cents, ask questions, discuss and debate was the university. 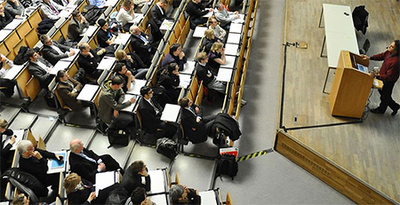 Universities were places where students discussed everything from history to politics to science to ethics, sometimes in overcrowded, smoke-filled lecture halls, where many wore suits to such debates. Today streetwear and sportswear have replaced the suits among students and you can pretty much debate anything, at any moment and with anyone through social media or video platforms. How do professors survive in an era where students are more likely to get correct answers to their questions through Google, in an era where they are more likely to find better orators giving lectures on Youtube, and where they are more likely to find stimulating debates on Facebook than in the classroom. Universities have survived with “propaganda” or let’s just say advertisements according to which you make more money if you have a college degree than if you don’t, and the more degrees you have the more money you make. Businesses have bought into this with something they like to call “professional development” which is just a buzzword for let’s pay money in exchange for a piece of paper called a certificate of attendance according to which you attended (often dull) lectures in which you (were supposed to) learn how to do a better job. I must say that not all of it is dark and gloomy. On the one hand, I have noticed that some students with college degrees today have a better grasp at their course materials than those who studied 20 or 30 years ago. Naturally, they had more access to alternative and concurrent education to their university education, meaning that they could travel, attend online seminars or learn in Do It Yourself mode and have a good grasp of their course material. On the other hand, universities have made it possible for some to graduate without really mastering their subject content. This, coupled with constant technologic and innovation in almost every field, means that what you learn in college becomes obsolete pretty quickly. I have noticed that some tenured professors are having trouble catching up with all the new literature, and pretty much read notes derived from Wikipedia or some other source, notes they barely understand. Also, technology has made it possible for administration to become scary, tyrannical bureaucrats. With QS and other university rankings in mind, they often issue, sometimes contradictory orders to students and professors on how to act and perform. One day professors need to write three papers within the next year or they’re out, the next day professors are supposed to give three lectures at different venues or they’re out, the next day students and professors need to be active volunteers for strange causes or they’re out. How do professors survive with all this? How do you rate research? Some like to rate professors based on how many citations they got, others based on how many books they’ve published, others based on other “activity” measures. But there are two things that make it difficult to rate professors: research is often a test of time (some research becomes obsolete pretty quickly while other stays relevant much longer) and you can’t really measure how much students learn from professors (some professors are a lot better at transmitting information and letting it stick than others). What will tomorrow’s universities look like? Perhaps they will remain what they’ve always been, a good place to meet your first wife. And graduate school perhaps a good place to meet your second wife. That is if fraternities and sororities still allow you to do so.